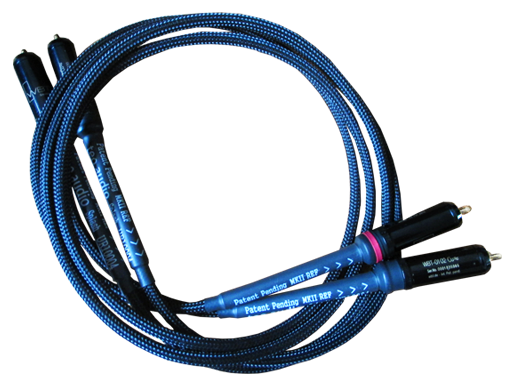 So what makes Teo Audio’s Liquid Cable special? For the last thirty years or so, the larger audio community, listeners and creative types alike, has become polarized around the question of whether or not the cables used to connect recording and playback devices can affect the quality of reproduced audio. The competing factions can be loosely divided into two camps: the subjectivists and the objectivists. For subjectivists, a change in connecting cables in an audio signal chain can introduce a perceptible change in the sound of the system. Objectivists point to measurements and formulae and insist that such perceptions of change have no basis in reality. TEO, while sharing an objectivist desire to correlate experience with data, is in the subjectivist camp. We hear differences in cables, and assume, that since you’re visiting with us, that you do too. We subjectivists have typically listened to, and a lot of us have bought, many different cables for our sound systems. Given, in the opinion of the unenlightened, our obsessive natures, many of us have also digested white papers, engaged in debate about the merits of various conductor sizes, configurations and geometries, materials, alloys and laminates, and have championed diverse insulating materials and connector designs. Yet, until TEO Liquid Cable, no one had questioned a simple and fundamental premise: conductor material is solid. With a solid conductor, or rather, an alloy or element in a solidus (below melting point) atomic lattice configuration. In such condition, ‘electrical response’ , or electron flow, is restricted to electron orbital ‘co-joined’ pathways in the atomic lattice. This is the situation in what we call ‘DC Flow’ in the given conductor. This relates to named observations like Johnson–Nyquist noise. In a liquid conductive pathway, things are markedly different, regarding electron transfer conditions and electron flow. First, to define a liquid conductive pathway, in being one that is occuring at the ‘atom to atom’, or even ‘molecule to molecule’ level. Meaning, no solids in a liquid carrier. At the atomic level – a liquid, likened to that of liquid water. Under such conditions as a true liquid conductor, electrical transfer characteristics change dramatically, in, for the most part, far more advantageous ways as compared to that of a solid conducting pathway. This, regarding use as an ‘audio’ cable. The liquid metal cable thus has RF waveguide considerations, magento-hydrodynamic flow and function considerations, as well as retaining some conditions of DC flow characteristics. A solid metal wire is confined to simple DC flow considerations, and all points above or beyond those DC considerations, with a complex AC audio signal applied to the solid wire cable are inherently a compromise and generate distortion. This is why there are so many solid wire cable geometries in the world of audio cables. They are all attempts to circumvent a limit which cannot be stepped beyond: the limit of solid wire being most suited in theory and practical reality for simple DC signal transfer, or one singular specific characteristic frequency. Our best. No stone unturned, cost no object, the best we can do. All latest technological insights are incorporated into such issuance. The best we can do, with cost constraint fully in place. Some say it is the greatest bargain in the world of cables (reference version), handily besting the best from any competitor. This is a believable opinion,as the technological advantage of the liquid metal as a conductor for audio signal propagation and transfer, easily places any cable of such construction a full magnitude and technological level beyond any effort that utilizes ‘wire’. The Standard is exactly that, ‘The Standard’. Not the peak, not the least expensive, but the middle child. It was our first cable design using the new liquid metal technology. It remains in the line-up today, in generational form. This led us to experiment with interconnect cables engineered using liquid conductors. The results are amazing; the proof is in the listening! TEO’s Liquid Cable interconnect cables are best characterized by their absence of character. When you replace your existing interconnect cables with Liquid Cable, different recordings simply sound more different and, consequently, more like themselves. Setting aside, for the moment, stock audiophile descriptors like dynamics, air, and soundstaging, what you’ll hear with Liquid Cable is information: unvarnished and uneditorialized. What type of violin bow, how far from which type of microphone, producers’ tricks, edits and effects; in short, all of the information that brings us closer to our ideal of being there.